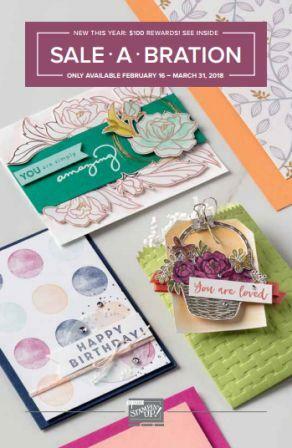 Sale-A-Bration is one of the best stampin’ times of the year and it begins tomorrow (as does the 2019 occasions Catalog)! What makes it so great? There are three ways you can take advantage of this sale which goes through March 31. With a $50 or more purchase, you can choose a free item from our Sale-A-Bration brochure! There are items available at the $50 level and items available at the $100 level. There is no limit to the number of free sets you can get! If you spend $50 can choose 1 free item, spend $200 and choose multiple free items! In order to get a free item you must place you order of $50 or more all at once (it can’t be split up $25 in one order and $25 in another.) You can, however, do $50 at one time and $50 at another. When your party totals at least $250, you get an additional $25 worth of free merchandise, on top of the normal Hostess Stampin’ Rewards. You can get free items as a customer and a hostess all in the same party – that’s why it’s so wonderful to be a hostess during Sale-A-Bration! Option 1: Get $175* worth of Stampin’ Up! products for just $99.00! Option 2: Get $175* owrth of Stampin’ Up! products plus the exclusive Craft & Carry Tote (valued at $50) for just $129.00. *This is $50 more free products than usual. If you have questions about Sale-A-Bration, do not hesitate to ask me! This is the perfect time to book a party for you and your friends! Too busy for an in-home party? No problem! As me about my Party-In-A-Basket option so you can take your party on the go. Share it with coworkers at work, with other sports moms during practice, and more! Tomorrow I will post information about the Sale-A-Bration Club I am offering this year. Be sure to check out the details so you can determine if you might enjoy this perk as well. We’ll be back to sharing projects after that! It’s Stamin’ Up’s 30th birthday! 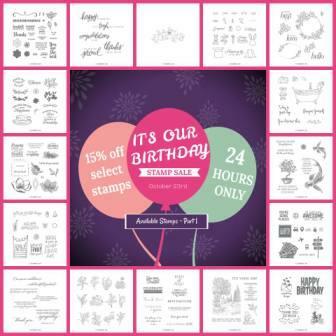 We are celebrating with a 24 hour sale on certain stamp sets! I realize these graphics are hard to see. You can view the list of stamp sets that are on sale by following the link. Remember, this stamps are available at the reduced price today only! You can order sets online at Shop.StampThat.com or Contact Me and I will be happy to place the order for you. We’re zipping right through August, aren’t we? I can’t believe school starts already next week. Yikes! There are so many things I still want to get done before then. Thankfully I’ve been able to put a couple mental check marks in the last couple days. Whew! In the busyness of the days, don’t forget about the Colorful Season goodies Stampin’ Up! is offering this month! These items are available during the month of August (while supplies last). We also have Bonus Days going on right now too! This is a great month for stocking up on Christmas project supplies! Stampin’ Up! is offering a special suite just during the month of August called the Color Your Season Bundle. I introduce this bundle in the All Occasion Card class and now I want to show it to you! We made a very simple card in class using one of the stamps, but there really is a lot more to this set! If you’ve had your eye on the new Designer Series Papers, you’re going to want to take advantage of this sale! 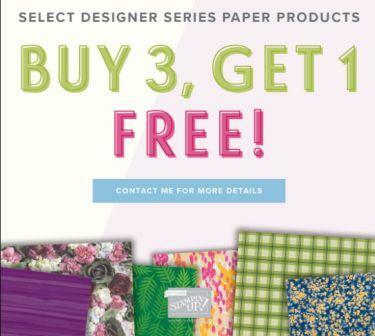 This month, you can purchase 3 select packs for Designer Series Paper and receive a 4th pack for free! View the Designer Series Paper packs which are available with this deal! 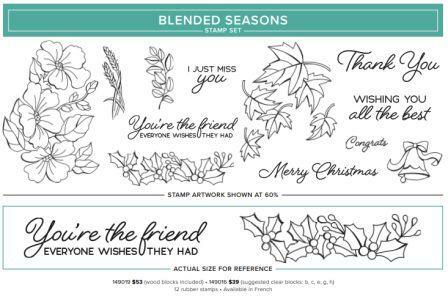 I will be happy to place an order for you, or you can visit my Online Stampin’ Up! store and place your order there. The last few years Stampin’ Up! has given us additional free Sale-A-Bration items mid-February. This year is no different! Beginning today, you have a few more free options to choose from! These are in addition to the great items we have already been enjoying since the start of January. You can view the new Sale-A-Bration freebies by clicking on the link or the picture. Don’t worry, the other Sale-A-Bration goodies are still available as well! Be sure to take advantage of all the free items you can get from Stampin’ Up! right now. I know this is my favorite time of year to stock up on items such as grid paper, adhesive refills, Stampin’ Mist refill, cardstock, envelopes, and new cutting plates for the Big Shot. Speaking of the Big Shot, if you don’t have one, this is the best time to add it to your supply of tools! 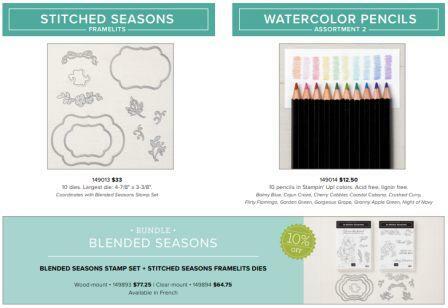 You can place orders in my online Stampin’ Up! store or contact me and I will be happy to do it for you. Thank you for coming by to visit today. Have a wonderful day! It’s getting close to time to say good-bye to the items in the Holiday catalog. We can now see which items will be retiring and some of them have been discounted with the Year-End Sales Event! You can check out the details on my online Stampin’ Up! Store. Orders can be placed there in the store, or I am happy to place Stampin’ Up! orders for you. Please note that some items are available only while supplies last, so don’t wait to place your order!